The Thunder are still two and a half games behind the Spurs in the standings, but they’re favorites to make the Finals again, regardless of whether Tony Parker’s injury allows them to slide into the no. 1 spot — where there’s about a 50-50 chance they’d meet the Lakers in the first round. Oklahoma City deserves the favorite’s perch in part because it appears it has figured out some very basic things that work against key opponents, including San Antonio and the Lakers. That was very clear in last night’s semi-blowout, when the Thunder attacked Dwight Howard as if it were May 2012 and they were facing Andrew Bynum’s Lakers again. In that series, the Thunder understood Bynum would be loath to step anywhere above the foul line, and so they used actions specifically designed to exploit that tendency to lay back. Kevin Durant could rain all the wide-open 17-footers he wanted off pick-and-rolls and catch-and-shoot curl plays, until Bynum grumpily decided he absolutely had to venture out an extra step or two. He wasn’t comfortable doing that, and the Lakers in general had no answer for the Thunder’s offense in a five-game series that, despite three close games in the middle, felt like a fair assessment of the gap between the teams, given that the other two games were gigantic Oklahoma City blowouts. Howard’s guy (Chris Bosh) is now setting a second pick for James, and Howard, rather than coming out to do his normal job, is pointing for Gasol to switch onto Bosh and stay up with LeBron. There’s nothing wrong with that. Howard and Gasol are both pretty slow this season, and minimizing movement with on-the-fly switches like this can be healthy. Lots of teams do it, and this kind of communication between big-man partners is essential in developing a good NBA defense. 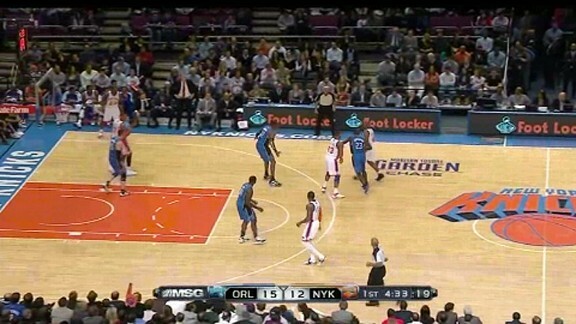 But Howard rarely did this in Orlando when teams ran rescreen actions at the Magic. It’s just a small thing to monitor. It’s not as if Howard roamed out to midcourt on every defensive possession during the height of the Stan Van Gundy era in Orlando. He didn’t. Van Gundy preferred that Howard stick around the paint and rarely had him guard stretch power forwards or even “stretch centers” until crunch time if a paint-bound Aaron Gray type was available. But when “hanging back” for Orlando, Howard didn’t begin at the dotted line, and he was happy to help out beyond the 3-point line if circumstances required it. That second play almost looks like Orlando Dwight — the dramatic shift to Durant’s left side, then the shift above the middle of the foul line as Durant arrives there, and finally, a very strong challenge as Durant jukes back to the left. All very good stuff, and a reminder that this limited version of Howard still makes a very big difference. The Lakers for the season have allowed 101.9 points per 100 possessions with Howard on the floor and 107.6 when he sits, per NBA.com. The first number would rank 12th overall; the second one would rank 28th. The Lakers also give up many more shots in the restricted area when Howard sits, and opponents have made a higher percentage of those shots. But even that happy 12th-overall mark just isn’t going to do it against a Thunder offense neck-and-neck with Miami for the no. 1 spot in points per possession. They are a potent bunch, and they know exactly what they want to do against a Bynumized Howard. The bottom line for the Lakers: Their defense stinks, and as long as that’s true, they are not a realistic threat to do damage in the playoffs. The whole “race for eighth” thing is great fun, a storyline that may provide some drama in the last week of the season (the Lakers host Houston in the season finale), but it’s basically a race to get swept or tossed aside in five games. Even during this 13-6 stretch in which the Lakers have revived their playoff hopes, they’ve allowed 104.2 points per 100 possessions — a number that would rank about 21st overall, nestled right near Phoenix and Detroit. Teams that surrender points at that rate generally aren’t around after the first week of May. 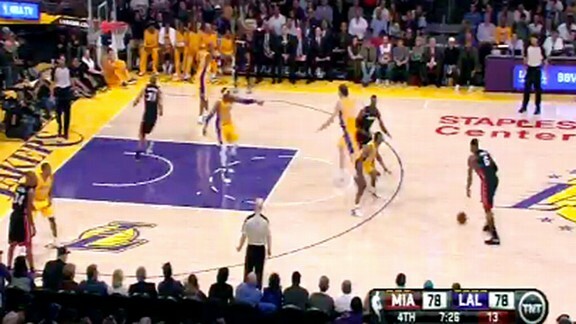 Last night’s game was also an advertisement for how much the Lakers need Pau Gasol back. Teams are just destroying L.A. when both Howard and Gasol are off the floor; they’ve allowed 117.1 points per 100 possessions when the stop-gap Antawn Jamison–Earl Clark–Metta World Peace trio plays together, a number that is so much worse than Sacramento’s league-worst mark as to be almost silly. If the answer to any question is, “We need more minutes for Antawn Jamison,” your team’s season is basically over. They also need Gasol’s offense against smart and active defenses, and that’s another area in which the Thunder have gradually figured out how to play against good teams and specific opponents. It clicked for them midway through last season’s conference finals, when they switched things up on Tony Parker and took one collective step into the paint to shut off penetration, confident their length and athleticism were good enough to recover in time elsewhere. Give the Thunder some weak offensive players and shaky shooters, and they’ll go ahead and ignore those players, clog the paint, and muck up more threatening stuff. It was clear last night that just about everyone but Kobe Bryant and Steve Nash qualified as a non-threatening player; they felt confident enough to play just about half the game with small lineups featuring Durant or even Ronnie Brewer at power forward. No such lineup logged more than 12 minutes total in five playoff games against the Lakers last season, per NBA.com; the Lakers’ collective size, and Oklahoma City’s lack of a non-Durant matchup for World Peace, had the Thunder playing “big ball” for nearly the entire series. 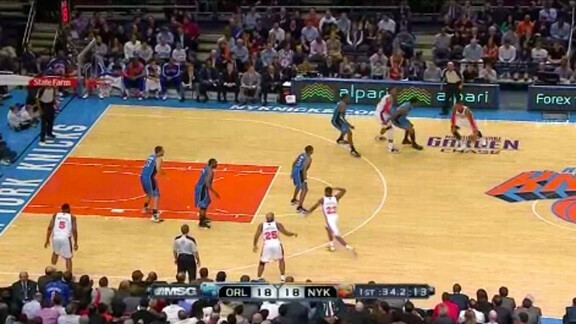 Last night, they had Kevin Martin guarding Clark or Jamison. The Thunder’s bigger lineups, and the starting lineup in particular, have been much more effective this season, but any team allowing Oklahoma City to play Durant extended minutes at power forward is asking for some mammoth scoring numbers. Gasol may be out all the way until the playoffs, if the Lakers get there, and the history of guys returning from injury and immediately to high-stakes playoff games is uneven. Even with some schedule advantages — though not tiebreak advantages at this point — over the teams right above them, the Lakers still need to qualify first. And if they keep playing defense like this, that won’t be easy.